Morgantown, PA. On Saturday, April 6th Civil War buffs and enthusiasts are invited to come out to Historic Joanna Furnace to learn about Civil War reenacting. 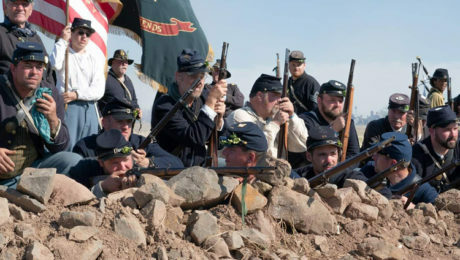 On this day the PA 50th & 69th Civil War regiments will meet at historic Joanna Furnace for their annual training day. This is where participants in these Civil War groups will go over all safety aspects of the hobby including proper handling of the rifle, as well as proper rifle firing techniques. The groups will also drill their troops, so they are ready to maneuver properly while out at Civil War reenactments. In addition, all personal reenactment equipment is checked to make sure that each member is ready to take the field safely. Guests are welcome to come out to Joanna Furnace on this day to observe and to ask questions. Plus, visitors who want to get involved in Civil War reenacting are welcome to sign up to be a part of this living history group. Admission and parking are free at this event. The event starts off at 7 am with an all-you-can-eat pancake and sausage breakfast in the Joanna Furnace Mule Stable. Other light fare including hot dogs, soup and drinks will be sold throughout the day. In the evening from 6:30 to 8:30 pm Hay Creek Valley Historical Association volunteers will join in the festivities with a lantern-lit tour of the 18th & 19th century Iron Works. Visitors will be able to visit the old furnace store/office, charcoal barn, blacksmith shop, casting house and see the iron furnace itself. The 69th Pennsylvania Volunteer Infantry an Irish Unit, also known as the 69th Penna. Irish Volunteers is mostly known for repulsing Pickett’s charge at the “Angle” at Gettysburg on July 3rd, 1863. The 69th PVI fought every campaign with the Army of the Potomac from 1861-1865. Of the 1,007 men mustered in, in 1861, less the 56 still served at the surrender at Appomattox in 1865. Today the 69th PVI is made up of individual men, women, fathers, sons, women, and families from all walks of life who are engaged in a wide variety of activities. We welcome all individuals who are interested in joining us to honor the men of the 69th Pennsylvania Volunteer Infantry. 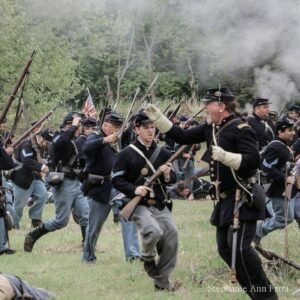 The 69th PVI honors the original 69th members by participating in Civil War reenactments, School presentations, Parades, Living histories programs as well as raising money for grave preservation of the unmarked graves of the original 69th PVI members. Each year before our reenacting season starts, the 69th PVI participates in the School of Soldier. This is where we get together to refresh and to shake off the rust so to speak over the winter down time. We go over all safety aspects of the hobby including proper handling of the rifle, as well as proper rifle firing techniques. We also drill the troops, so they are ready to maneuver properly while fighting in the field. All personal equipment is checked to make sure that each member of the 69th PVI is ready to take the field safely. The School of Soldier event will be shared with the 50th PVI. The 50th PVI is from Berks County, Schuylkill County, Lancaster County, and Luzerne County. The 50th was mostly a German unit. They were known by General Grant as “Old Reliable”. The 50th PVI was at Ft. Wagner with the 54th Mass. You may have seen the movie “Glory” which covers this battle at the end of the film. The Hay Creek Valley Historical Association is a 501(c)(3) non-profit charitable organization dedicated to the preservation and education of America’s iron heritage. Net proceeds from this event support the restoration and educational projects of The Hay Creek Valley Historical Association and Joanna Furnace, a historically significant 18th and 19th-century charcoal-fueled iron furnace. Anyone wishing to find more information about the 2019 events or educational programs at Joanna Furnace can visit the Hay Creek Valley Historical Association website at www.haycreek.org or call 610-286-0388. The Joanna Furnace site is located three miles north of Morgantown, along Route 10. For entrance turn at Furnace Road. MORGANTOWN, PA The Hay Creek Valley Historical Association is a-wear’n the green!! So pick up an Irish Brogue . 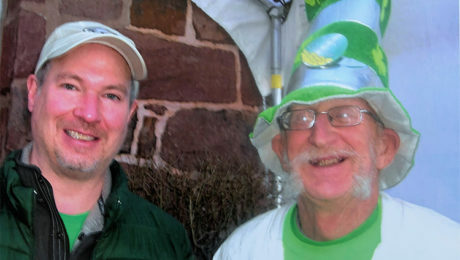 . . bring your clan and your appetite to a fabulous ‘Irish Breakfast buffet’ on Saturday, March 16 from 7:00 a.m. to noon. That morning Joanna Furnace, figuratively, turns green with the best Gaelic atmosphere and eating imaginable. 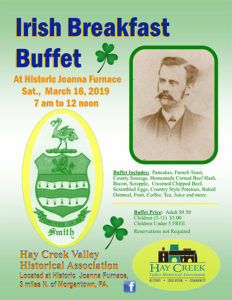 And if the food isn’t enough to draw people to the furnace, the entire buffet will be enhanced by traditional Irish music performed by Hay Creek’s own Lady of Song, Phyllis Hummel. This homage to Ireland will feature a hearty, traditional Irish buffet of Pancakes, French toast, County Sausage, Homemade Corned Beef Hash, Bacon, Scrapple, Creamed Chipped Beef, Scrambled Eggs, Country Style Potatoes, Baked Oatmeal, Fruit, Coffee, Juice and more. The cost for the Buffet: Adults $9.50 Children (5-11) $4.50 Children under 5 FREE. Most of the Irish, and some Scottish songs to be heard would have been familiar to the Scotch-Irish workers at Joanna Furnace and their families in the local community. Reservations are not required to attend. March is the month when the Hay Creek Valley Historical Association opens up its doors and welcomes new volunteers to step forward and learn about being a tour guide at Joanna Furnace or taking a hands-on craft class on an early American trade. 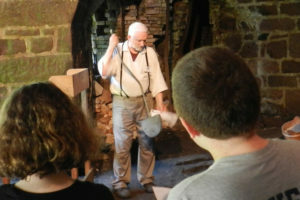 This year’s course offerings includes: March 12th – Learn to be a Joanna Furnace Tour Guide, March 16th – 19th Century Metal Casting, March 16th – Candle Making, March 19th – “Letters of a Daughter’s Devotion Preserved for Centuries”, March 26th – 19th Century Iron Production at Joanna Furnace, March 30th – Early American Cooking — Colonial Chocolate, April 6th – School of Soldier, April 27th – Natural Dying. For more information or to register for any of these classes please email info@haycreek.org. MORGANTOWN, PA . . . 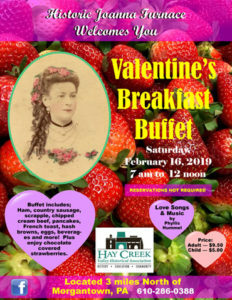 The 12th annual all-you-can-eat Joanna Furnace Valentine’s Breakfast Buffet, with live musical performances, will be held Saturday, February 16, at Historic Joanna Furnace Iron Works. This first event of the year opens the Joanna Furnace museum for a tremendously exciting season. In 2019 there will be many things happening at Joanna Furnace. The 1791 iron-making community will be preparing for three major annual festivals, numerous programs for public schools and three significant restoration projects, plus the Monthly Saturday morning events. The Valentine Breakfast Buffet, open from 7 a.m. to 12 noon., will feature a traditional and varied breakfast buffet. Families can enjoy fresh country sausage, ham, scrapple, bacon, creamed chipped beef, scrambled eggs, pancakes, pancakes with chocolate chips French toast, hash browns, fruit sauce, beverages (including whipped hot chocolate) and our delicious Joanna Furnace chocolate covered strawberries. 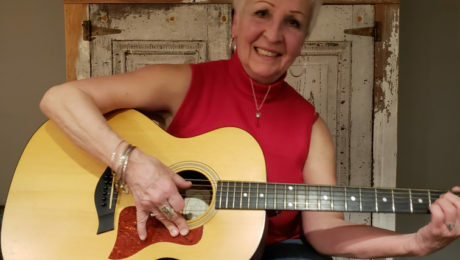 Denver area guitarist Phyllis Hummel will play acoustical guitar and sing a variety of romantic ballads throughout the event. Ms. Hummel has been performing for more than 20 years in the Tri-County area and has performed at many area establishments. Reservations for the Valentine’s Breakfast Buffet are not required. Admission for individual adults is $9.50, Children are encouraged; ages 5 – 11 are $5.00 and those under 5 eat free. The Hay Creek Valley Historical Association is a non-profit organization. Net proceeds from this event are used to support the educational programs and restoration of Joanna Furnace. This significant 18th and 19th-century charcoal-fueled iron furnace community is nestled in a valley just off Route 10 on Furnace Road—north of Morgantown. For more information, visit the Hay Creek Valley Historical Association website at www.haycreek.org or call 610-286-0388. 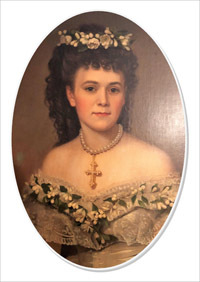 An 1868 Historic Ironmaster’s Wedding . . . and you can be a guest! Morgantown, PA. The Hay Creek Historians are honored to announce their most exciting historical reenactment event for 2018! 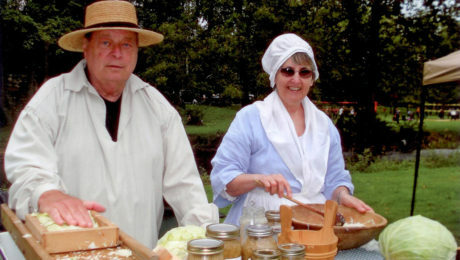 The invitation has just been issued inviting area residents to the wedding reenactment of the last Joanna Furnace Iron Works ironmaster L. Heber Smith and Ella Jane (Jennie) Grubb of Lancaster. This elegant Victorian Wedding, dinner and reception will take place Saturday, June 16, 2018 – 5 to 9 pm at Historic Joanna Furnace, near Morgantown. The Hay Creek Valley Historical Association is proud to partner with Fecho Productions, LLC in cooperation with the Genesius Theater of Reading PA, to bring a one-of-kind historical theater/dining/dancing experience that will honor the last ironmaster of Joanna Furnace, L. Heber Smith and his bride, Ella Jane Grubb. Theater master, Lawrence Fecho, and an all-star professional cast will bring the Smith and Grubb families to life. Fecho is currently the Artistic Director of Genesius Theatre, in Reading, Pennsylvania, where he began his theatrical career at the age of twelve. He started his professional career as a staff assistant for the late great Broadway Producer, Alexander H. Cohen, and consequently worked on the 1977 Tony Awards. Mr. Fecho has directed, produced and designed over fifty productions at Genesius Theatre and his company, Fecho Productions, produces the annual “A CHRISTMAS CAROL IN WEST READING,” murder mystery presentations, and corporate team building games up and down the East Coast. This entire event gives new meaning to the concept of dinner theater. From the time the bride arrives in her elegant two-horse Victorian carriage, to the ceremony, then the dinner/reception and finally the dancing, attendees will become participants in an accurately depicted 1868 Victorian wedding. The horses and carriage are from White Chimneys Estate in Lancaster County. Weather permitting, after dinner, attendees can have a carriage ride for a nominal fee. Also, a photographer will be on hand to take photos of the wedding guests in the Victorian parlor. Photographer, Bill Swedas will then post files online and guests will be able to print out their photos in a period genre. Nine Professional actors will take on the roles of the newlyweds and the Smith and Grubb families. To round out their 19th-century experience, members of the audience will be given 1868 period identities. Guests to this summer social will interact with historical figures from 1868 and become part of the show! Followed the wedding ceremony, before the dinner, butlered hors-d’oeuvres created by the HCVHA food service team, will be served. The appetizers include puffed pastry with crab, cheese salmon rounds and fruit skewers. A catered dinner by Shady Maple Catering will follow. The main courses feature herb baked chicken breast, slow roasted tender beef, green bean almandine, parsley buttered potatoes, tossed salad with lemonade, coffee then be served. A wedding toast to the new couple happens after the meal. Dinner will be followed by the cutting of the beautiful Victorian Wedding Cake and then dancing as part of a traditional 19th -century wedding celebration. The Victorian Wedding Cake is created by Shady Maple Bakery. The 19th-century ceremony and dance music will be provided by Beck’s Civil War Brass Band. 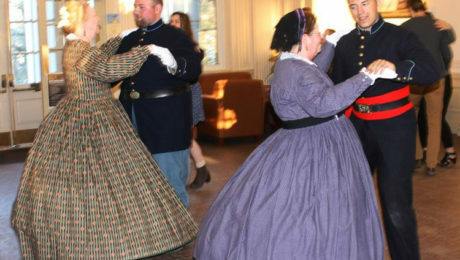 The Civil War period dance styles will be presented by the Civil War Dance Foundation. A dance master and floor managers will guide guests in dancing to the steps of the era. As an added benefit for people making reservations to attend this event, a free two-hour workshop will allow all those interested in learning 19th-century dance styles. This free pre-event workshop for reservation holders will be held on Thursday, June 7 from 7 to 9 p.m. at Joanna Furnace. In keeping with the historical interpretation standards of the HCVHA, this event will be as accurate as possible to the social conventions of the 1860’s. The Ironmaster’s Wedding takes place at Historic Joanna Furnace off Route 10, on Furnace Road, three miles north of Morgantown. The June 16th wedding and celebration begins at 5:00 pm and ends at 9:00 pm. Parking is free. The Hay Creek Valley Historical Association is a non-profit 501(c)(3) charitable organization. Tickets are required to attend. Cost: $65.00 per person or $120 per couple. To reserve tickets or for information about this once-in-a-lifetime celebration call, 610-286-0388 or email mzerr@haycreek.org . Celebrate May with the historians of the Hay Creek Valley Historical Association. 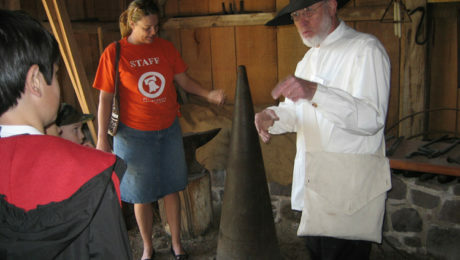 On Saturday, May 19 from 7 am to 2 pm; families are invited to a day of many things to do at Joanna Furnace Iron Works. This means numerous engaging historical activities to meet everyone’s fancy. The Pancake and Sausage Breakfast is served from 7 a.m. to 11 a.m., $6.50 for adults, $4 for children aged 6 to 11, five and under eat free. The menu includes fresh country sausage, pancakes, orange juice, coffee and will be served in the Mule Stable Dining Area. Other foods will be available throughout the day. A large variety of spring and summer flowers, shrubs and decorative items for the home will be available to purchase. Plants will be available for sale on a donation basis. Anyone wishing to donate plants and garden supplies for the sale shall drop them off on Friday, May 18th at Joanna Furnace. The Hay Creek herb specialists will be in the Joanna Furnace Herb Garden where visitors can also learn about the 18th & 19th Century “4 square” herb garden. Here visitors will learn about the medicinal and culinary uses of herbs found in the Joanna Furnace herb garden which is just like those found at homesteads of early Joanna Furnace workers. After breakfast, the entire family can shop for that special basement or attic treasure in the HCVHA flea market, which is open from 7:00 to 2:00. Anyone interested in having a stand in the flea market is more than welcome. Space reservations are not required. Flea market set up begins at 6:00 a.m. Vendors with car parts, mechanical technology items, antiques, child or household items are welcome to participate. To register for a booth contact Kathleen at 610.914.8152. The stand fee is $10, and stands are available on a first-come basis. Previous flea markets have included household, antique and vintage items, tools, books, children’s clothing, toys and more. 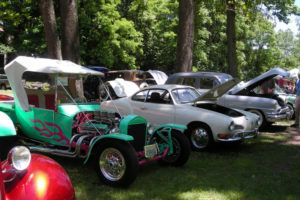 The historic site will be transformed into a wide-ranging display of classic and antique automobiles plus motorcycles. 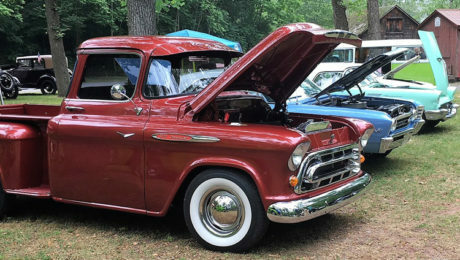 Any proud owner of a restored vehicle is invited to show his pride and joy. Persons wishing to show a car, truck or motorcycle should plan to arrive between 7 and 11 a.m. For more information about the vehicle show please contact Cliff at 484-529-9078. The classic car and motorcycle exhibit will be enhanced by other technology exhibits, a hill climb and prizes for show winners. The hill climb at Joanna Furnace this year will have two classes – antique cars & show cars. The timed competition will require vehicles to climb the old Furnace Road and make two stops to “plant and cover a potato in a basket”. Awards will be given to the hill climb winners. At 1:15 pm the Hay Creek Valley Historical Association will offer a special parade at the event to honor all military personnel. All veterans and current servicemen are welcome to be a part of this parade. The introductory 20-minute video on the history of the Joanna Furnace industry and community will be shown beginning at 9 am in the Blowing Engine House. Self-Guided tours of the 200-year-old iron furnace site will be on-going after 9 am. Interpreters will be greeting guests in the restored Blacksmith Shop, Casting House, Office/Store and Charcoal House Museum. These monthly Hay Creek events are designed to have visitors learn about specific aspects of Historic Joanna Furnace and the Hay Creek Valley . . . the history and importance to 18th, 19th and early 20th-century life in the tri-county area. For 2018, May’s Third Saturday event will be the last of the season. The next big event will be the Ironmaster’s Wedding Historic Dinner Theater event on June 16th. This event is a dinner theater program commemorating the wedding of the last Joanna Furnace Ironmaster L. Heber Smith and Ella Jane (Jennie) Grubb in 1868. The program will consist of a professionally acted wedding ceremony, an elegant sit-down wedding dinner, and a reception with dancing to post Civil War music. The wedding will be a “by reservation” event only. The HCVHA is proud to be partnering with Fecho Productions, Genesius Theater and Shady Maple Catering and Bakery. Other event partners include Zerbe Retirement Community, Knights Rental, Masthoff Press, Knies Insurance and White Chimneys Estate. For more information, check out www.haycreek.org. The Hay Creek Valley Historical Association is a 501(c)(3) non-profit charitable organization dedicated to the preservation and education of America’s iron heritage. Net proceeds from all events support the research, restoration and educational initiatives of Joanna Furnace, a regional historically significant charcoal-fueled iron furnace. Anyone wishing to find out more information about any of the programs at Joanna Furnace can visit the Hay Creek Valley Historical Association website at www.haycreek.org or call the HCVHA Office at 610-286-0388. Morgantown, PA—Jump into spring with the historians of the Hay Creek Valley Historical Association. On Saturday, April 21 from 7 a.m. to 12 noon, families are invited to the Early American craftsman Day at Joanna Furnace. This event includes numerous engaging historical activities to meet everyone’s fancy. Visitors can learn about the traditional four-square herb garden, the herbs and their uses in the household. The twenty-minute introductory video “This is Joanna Furnace” will be showing the history of the Joanna Furnace Iron Works and Community continuously from 9 am. The Hay Creek Valley Historical Association opens its doors to the community and allows individuals to sell their flea market items at our breakfast flea market. In addition, non-profit organizations are welcome to participate in this flea market as well to promote their own organizations. Booths are free to all non-profit groups. Vendor setup begins at 6 a.m.
Flea market booth sites are priced at $10 each. All Joanna Furnace events are planned to have visitors learn about specific aspects of the furnace community’s history and its major importance to 18th, 19th and early 20th-century life in the tri-county area. Note . 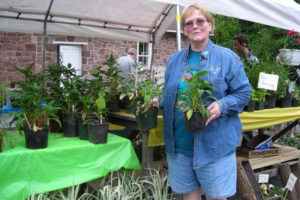 . . Each month during spring, the HCVHA focuses on a different event theme and explores various aspects of the 227-year-old iron making community. Next Month, May 19th – The HCVHA will be honoring American veterans and will host the annual Hay Creek Classic Car Show & Plant Sale. The Hay Creek Valley Historical Association is a 501(c)(3) non-profit charitable organization dedicated to the preservation and education of America’s iron heritage. Net proceeds from this event support the research, restoration and educational initiatives of Joanna Furnace, a regional historically significant charcoal-fueled iron furnace. The Historic Joanna Furnace Iron Works is three miles north of Morgantown, on Route 10. Turn on Furnace Road. Admission and parking are free for these monthly Saturday morning events. The Hay Creek Valley Historical Association announces the open invitation to annual Victorian Tea to be held at Joanna Furnace Iron Works on Saturday, May 12. Registers are now being accepted for this extraordinary event. There will be two seating’s, 11:00 am and 2:30 pm. This year, guests will learn about the recent engagement and upcoming Wedding of Iron Master L. Heber Smith and Miss Jennie Grube. 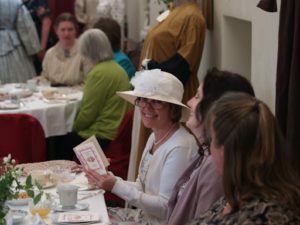 The tea focuses on the roles women of the business class played in the years following the Civil War. Attendees will enjoy a history program titled “Preparing for the Ironmaster’s Wedding”. 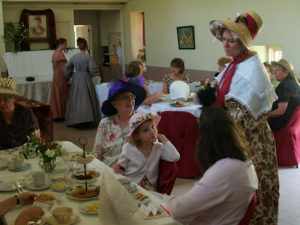 The Joanna furnace Victorian Tea is a formal event. It includes light fare and tea served on tables covered with our most elegant pressed linens and finest formal china. Servers will be dressed in period garb to meet this year’s 1868 period. “We like to give the public a glimpse into the life of women who would have been close to the ironmaster’s wife during the Victorian Age,” said Caroline Lee HCVHA Food Service Director. To follow the Ironmaster’s family traditions, this event is a ‘low tea’ service. That means the tea service will include the same light fare the ironmaster’s wife would have served to her most important guests. The term ‘low tea’ means guests were seated at a low table, typically in the drawing room or sitting room of an estate. HCVHA interpreters will use traditional recipes to make the light fare which they will serve to guests. “The food is all handmade from scratch so that we will be busy bees the day before the tea service,” said Lee. Some of the fanciful foods they will serve include scones, biscuits, cakes, breads, fresh fruit, finger sandwiches, teas and punch. 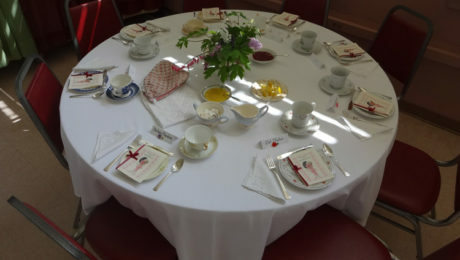 Volunteers will also teach guests about proper tea etiquette that was expected during low tea. “It’s a great way to teach little ones about table manners, and hopefully our younger guests will use the lessons they learn here at home and when they go out to eat,” said Lee. G uests are encouraged to wear their Sunday best; Victorian dress, gloves, and hats are optional. Admission for the Victorian Tea is $22, and registrations must be made in advance to attend the event. The deadline to register is April 23. Space is limited, so register early to reserve your place. Registration forms are available at www.haycreek.org. You can also call Caroline Lee at 610-670-0098 or e-mail info@haycreek.org for more information or to request a registration form. Historic Joanna Furnace Iron Works is located just off Route 10, three miles north of Morgantown. Turn on Furnace Road. Fascinated by 19th-century history? 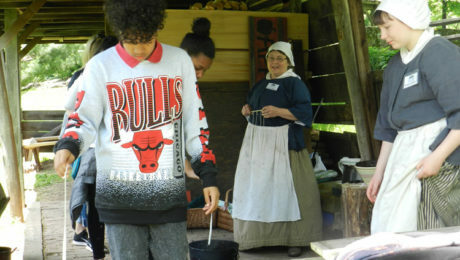 Interested in early technology, crafts, cooking, or how about the art of ironmaking? Enjoy working with visitors, children and school groups? The Hay Creek Valley Historical Association and the Joanna Furnace Ironworks Museum are now recruiting friendly persons who are interested in volunteering to be historical site tour guides for pour 2018 season. As a volunteer Tour Guide, you will lead small groups of visitors through the 226-year-old iron furnace complex. Your job will be to communicate the breadth of life in a 19th-century iron making community and blast furnace and introduce your group to the interpreters in each of the buildings. You will be taking the visitors back to a different place and time. Each year over 30,000 people visit Joanna Furnace. The education programs reach over 2,000 students from Berks, Chester and Lancaster Counties. Since 1980, over 1.1 million guests have visited Joanna Furnace. The Hay Creek Valley Historical Association invites interested persons to participate in one or all three of our Joanna Furnace History Training Classes coming in March. These classes will give basic, introductory level, information on assisting with tours at our upcoming fall festivals, public events and spring educational programs. History of Joanna Furnace – March 13th. This PowerPoint presentation will describe who the real Joanna is, why the furnace was built on this site in 1791 and discuss each of the historic Joanna Furnace Ironworks buildings. Meet the Smith Family (the ironmaster dynasty of Berks County) – March 20th. HCVHA Executive Director Mark Zerr and Smith family descendent and Education Administrator, Juliana Flora will introduce the Smith Family genealogy. Attendees will learn where the Smith family originated and how they ended up with the Joanna Furnace Iron Site. Did you know that the Smith families’ real last name was MacDonald? Garb Training – How to dress appropriately for our events and programs – March 27th. HCVHA garb trainer, Barbara Esterly will review women’s and men’s garb throughout the 100 years the furnace operated and demonstrate how to properly wear the period clothing. As interpreters and demonstrators, it’s crucial that all HCVHA Tour Guides and Interpreters tell a complete and historically correct story. To be a tour guide is to be a storyteller. All the 1 ½ hour classes are held on Tuesday evenings at 7 pm and are FREE to HCVHA members. Non-members are also welcome to attend the classes but will be required to give a $10 per class donation to the organization. RESERVATIONS ARE REQUIRED TO ATTEND EACH OF THESE CLASSES. Please email Mark Zerr at mzerr@haycreek.org or call 610-286-0388. Reservations must be made by March 8th. On Sunday, March 18th the Hay Creek Valley Historical Association will open its doors to the first educational presentation of 2018. 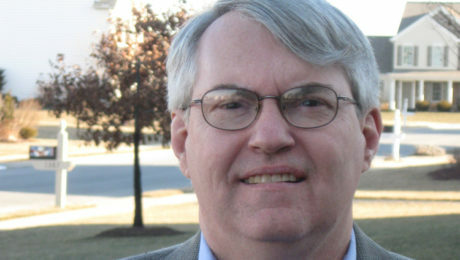 At 6 pm, Mr. Scott Mingus from York, PA will present an hour long Civil War program entitled “Flames beyond Gettysburg.” The program will be held in the Mule Stable meeting room at Joanna Furnace Ironworks. In late June 1863, two powerful columns of Confederate troops approached the Susquehanna River in south-central Pennsylvania. One marched northeasterly from Franklin County through Carlisle toward Harrisburg and the other headed eastward through Gettysburg and York towards Wrightsville/Columbia. This PowerPoint talk by veteran author Scott L. Mingus Sr. will cover the latter command, that of Maj. Gen. Jubal A. Early, as it conquered Gettysburg after a series of skirmishes on June 26 and then two days later occupied York, the largest Northern town to fall to the Confederates during the entire war. General Early ransomed York for money and supplies and surrounded the town with artillery and troops. Hastily organized state militia defended the river crossing at Wrightsville and then burned the world’s longest covered bridge to prevent Rebel passage into Lancaster County, from which Jubal Early had hoped to threaten Harrisburg. Mr. Mingus is a well-known authority on the Civil War and has authored over nineteen books focusing on various aspects of the conflict and the Underground Railroad. He will have some of his books available for sale that evening. Students, history buffs, HCVHA members and the general public are all invited to this insightful, exciting program sponsored by the Hay Creek Valley Historical Association. Admission to this special HCVHA educational program is free. Historic Joanna Furnace Ironworks is located three miles north of Morgantown, PA off Route 10—turn on Furnace Road. For further information visit www.haycreek.org or education@haycreek.org. Attractions 10 am to 5 pm daily. Free shuttle busses run continuously throughout the day. Welcome to the Hay Creek Festival. In the 42nd year our heritage festival is the most diverse event in Berks County, Pennsylvania. Today 1,500 volunteers bring together two centuries of history with authentic demonstrations of early American trades and crafts, mechanical technology exhibits, old time music, and a modern craft & antique market. 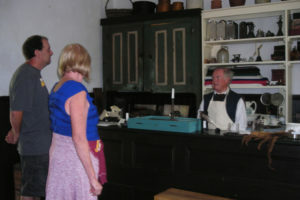 So “Step into the Past” and immerse yourself in a history that our forefathers would be proud of experiencing. Here ye! Here ye! The Hay Creek Festival takes pride in offering authentic traditional crafts and tradesmen with daily demonstrations taking place throughout the 26-acre Joanna Furnace ironmaking community. 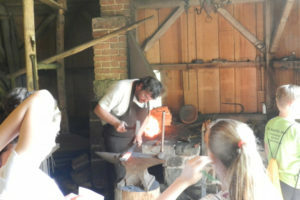 Visitors will experience what life was like 200 years ago in the quaint village of Joanna Furnace and see the hands-on skills of the 18th & 19th century townsfolk. Our community includes food preserving, laundress, weaver, seamstress, soap maker, broom maker, potter, tinsmith, gunsmith and pewter maker. The village woodworkers will be busy demonstrating adzing, pipe drilling, coopering and cutting timbers on a one-of-a-kind pit saw. Mail call takes place at 2 pm each day as the Villagers gather at town square to talk about the daily happenings.